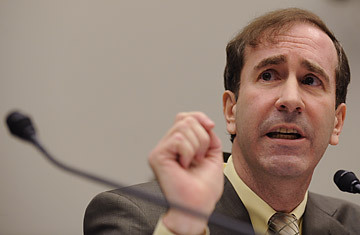 Independent financial fraud investigator Harry Markopolos testifies on Capitol Hill in Washington before the House Financial Services Capital Markets, Insurance, and Government Sponsored Enterprises subcommittee hearing on the Madoff scandal. From "Sir" Allen Stanford's recent alleged $8 billion CD sticky wicket to Bernie Madoff's $50 billion decades-long lie, it seems each new day brings another round of financial madness, and yet no one person or government agency seems to be moving fast to find a cure. But the Securities and Exchange Commission's Inspector General, David Kotz, is all ears for one group with answers: Wall Street's whistleblowers. To accomplish all that, Kotz and his team are listening carefully to whistleblowers like Harry Markopolos, the private securities fraud investigator who dogged Madoff for years and whistled loudly, and to others, both inside and outside the agency. "Harry has been helpful for two reasons; he has specifics on how Madoff operated and how he claims the SEC failed in listening to him. We are also listening to his recommendations for change within the agency." "We're going outside the agency for ideas," said Kotz. "It's good to have a different perspective." How important are whistleblowers in catching investor fraud? According to Stephen Obie, acting director of the division of enforcement at the Commodity Futures Trading Commission, over 50% of Ponzi schemes and other frauds he investigates come to him through whistleblowers and investor complaints. The CFTC is the sister agency of the SEC, handling commodities, futures, and foreign currency fraud. Even the SEC's new chairman, Mary L. Schapiro, in a recent speech said she wants to improve the SEC's "handling of tips and whistleblower complaints," though an SEC spokesman said it has no plans in the works. Obie and his team have uncovered seven new Ponzi schemes this year alone, the most recent being this week's $4.4 million affinity Ponzi hitting Hawaii's deaf community and, though not officially called a Ponzi, the SEC's alleged $8 billion CD fraud by R. Allen Stanford, the globe-trotting financier and cricket impresario. Markopolos has made several recommendations to the SEC, including moving the commission to the financial centers in New York and Boston, finding more trained "foxes" who know the business, the creation of a "super agency" that would have teeth, or the total disbanding of the agency and turning things over the New York Attorney General's Office and the Massachusetts Securities Division, which have "done a fantastic job and at an unbelievably low cost." Then there's Laura Goldman, another lone voice in the wilderness of Wall Street enforcement. Goldman, who blew whistles on such notable investment frauds as First Jersey Securities, Bayou Hedge Fund and Lydia Capital, among others, now has the full attention of SEC Inspector Kotz's office. In all, Goldman says she has alerted the SEC over 30 times and, despite its cold shoulder, through one means or another she has seen 25 of those tips lead to fraud charges being filed. "I wish the SEC had listened to me earlier; I could have saved a lot of people a lot of pain and suffering," the Wharton School of Business-trained Goldman said from her home in Tel Aviv, where she runs her own money management firm, LSG Capitol. In her 25-year career she's worked at Merrill Lynch and Paine Webber. After she talked about Madoff's operations on a Fox News TV show in mid-January (as an investment adviser, Goldman knew of Madoff but did not do business with him,) Kotz's office contacted her to ask her about Madoff, she says. Kotz and his staff also asked her for any suggestions she might have to fix things at the commission. In early February, Goldman provided Kotz's office with a list of 11 recommendations to fix the agency, including a 10% bounty on uncovering fraud, a retail-broker-trained commissioner, greater authority to jail or to levy severe financial penalties, and an online clearinghouse for complaints. In response, Heidi Steiber, senior counsel to Kotz, told Goldman that "many ideas were worthy of consideration." It's not just lip service either. One central theme Kotz is working on for his recommendation reports is creating new fraud-finder incentives, both monetary and other. "It looks like a big focus will be in creating a new incentive structure so folks will come forward to the SEC when they know something," says Kotz. "We know people knew things about Madoff, but we don't know why they don't come to us." Imagine getting 10% for blowing the whistle on Madoff's $50 billion scam. "It's a simple thing that will stop a lot of fraud fast," says Goldman. Kotz said his reports will have comprehensive recommendations, but warned that doesn't mean the agency will implement them. And though some fixes, a proposed rule to separate custodian accounts for hedge fund assets, may make it harder for thieves, smart fraudsters "will just begin to work in pairs; one will run the scam and the other will run the custodian operation," says Goldman. In the end, people like Markopolos and Goldman may have more answers than Kotz and his staff want to hear, but they are at least taking notes. "If Markopolos approached me, I might have thought he was a nut case," says Goldman, "But when you read his presentation, you would be forced to change your mind. It's very persuasive. People like us are different, that's why we do what we do. We are a little crazy, but we see harmful things and we want them stopped."